'You have to do Chappies' is a common thing people will tell you when you’re here to discover the Cape. 'Chappies', local slang for Chapman’s Peak Drive, is one of Cape Town‘s most famous landmarks (about 25km south of the Cape Town CBD). 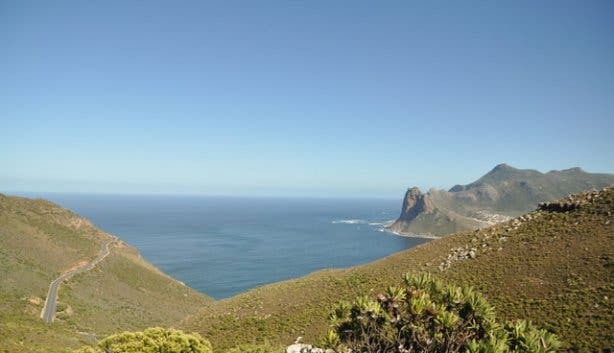 Nine kilometres and 114 curves of breathtaking scenery bring you from Noordhoek to Hout Bay, or the other way around. Some say it’s one of the most spectacular marine drives in the world. 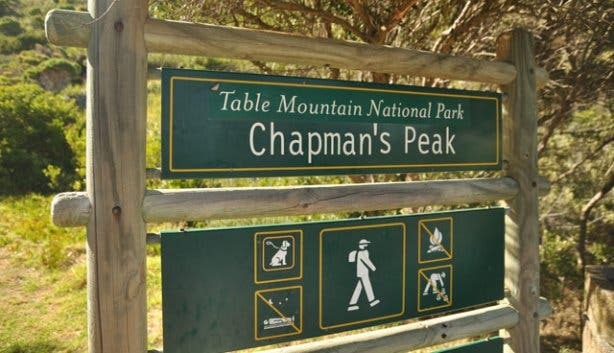 Hike above Chapman’s Peak for amazing views of the Atlantic Ocean, Hout Bay, Fish Hoek, Gordon’s Bay and a stunning mountain range, the southerly extension of the Constantia Berg (593m high) to be exact. Chapman’s Peak must be one of the least hiked peaks on the Table Mountain chain. I even call Chappies 'paradise' and a hike will provide you with even better views than the road. Some say it’s one of the most rewarding hikes on the Peninsula. Picnic. Fill your backpack with goodies and water for a picnic at the summit. Hiking shoes and a warm top. To keep safe, wear hiking shoes that give your feet astrong grip (I am wearing my V-Lite Altitude Ultra Luxe Wpi Hi-Tec hiking boots) and take a warm top because if the wind is blowing, it can be chilly. Hats and sunblock. There are patches of shade for you to rest in but the majority of the hike is exposed. It’s a good idea to get an early start to avoid the midday sun. Camera. The views are incredible – you would regret leaving your camera at home. Money for the toll. If you enter Chapman’s Peak from Hout Bay, you don't have to pay the toll if you are not exiting at the other end of Chapman's Peak. Ask for a daypass at the toll booth and you can hike or picnic for free. Also, if you choose the route ending at the Silvermine Nature Reserve, you have to pay a conservation fee. Drive through the toll gate in Hout Bay and continue until the parking area just below the ticket check point for motorists. There is a sign indicating the start of the hike. It is approximately a one and a half hour walk to climb the 500 or so vertical metres to the peak. 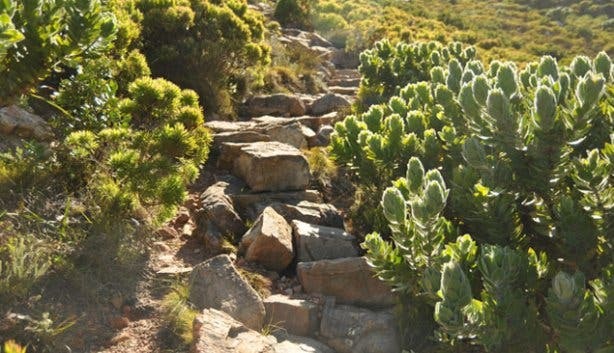 Enjoy walking up the steep path while being surrounded by proteas and other fynbos. Take your time, breathe in and enjoy the amazing scenery around you. The path is very well maintained and easy to follow, paved with sandstone rocks most of the way. 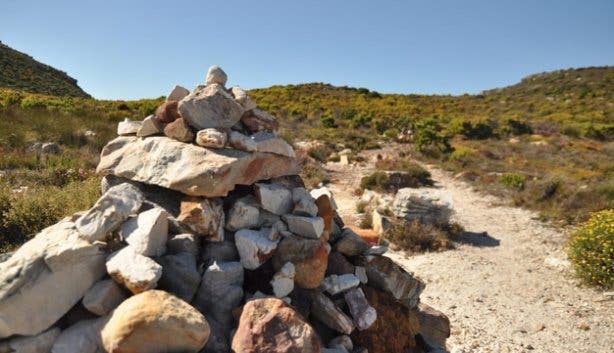 When you level out near the top, turn right and continue towards Noordhoek along a slowly rising path. You will move over and around the minor peak and eventually come to the rocky summit of Chapman’s Peak. 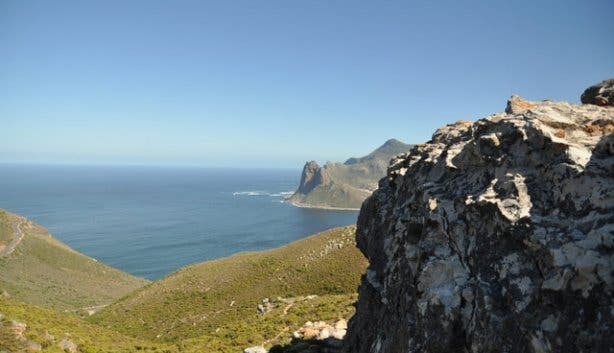 There are wonderful views of Hout Bay as you round the first peak, then suddenly Chapmans Peak pops into view and a final ascent up the saddle gives you views of Fish Hoek, Noordhoek Beach, and even Gordon’s Bay and Table Mountain on a clear day. To the south is Cape Point and Kommetjie. Some say it’s best to climb Chapman’s Peak later in the afternoon as in the morning much of the scenery is obscured by shadows cast by the morning sun and at midday the sun renders a lot of the scenery flat. However, in the late afternoon or sunset the area lights up with an iridescent red glow almost like hot coals as the sinking sun reflects off the normally bright sandstone cliffs. You may also be fortunate and enjoy a fantastic sunset, but even if you don’t the horizon is sure to glow red long after the sun has disappeared. Duration: Plan an easy three hours for the hike including a scenic picnic on the summit and stops for photographs. Since it is not a circular route cars will be required at both ends. 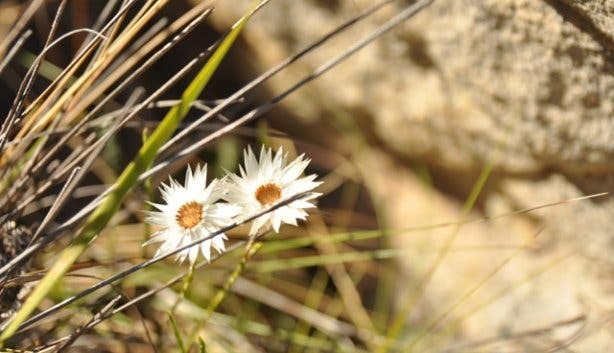 Park one car at the Silvermine Nature Reserve by the reservoir and the other at Noordehoek beach where you will start the hike. You get there when you turn right on the Ou Kaapse Weg coming out of Silvermine Nature Reserve. Drive towards Noordhoek; turn right into Silvermine Road and then right at the T-junction into Noordhoek Main Road (M6). Pass the Noordhoek Village centre on your right and two paddocks on your left, before turning left into Avondrust Circle. At the second right turn into Beach Road and follow the signs to the beach parking lot. Okay, now it’s time to get the hike started. 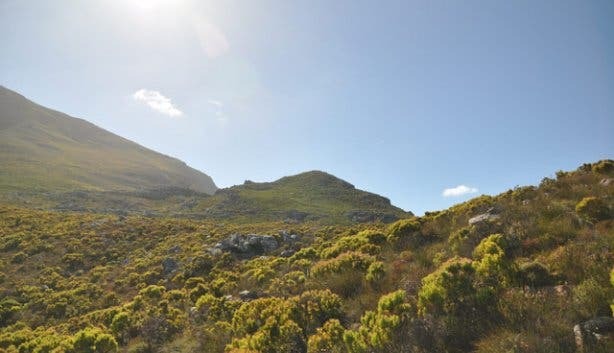 This hiking route climbs up from Noordhoek Beach to Chapman’s Peak, drops down the other side and heads up again, before the final drop down to the Silvermine dam in Silvermine-west. The path does climb and drop a couple of times, but the steep sections don’t last long and the rest is gradual. There is no exposure to heights. Duration: Plan a good six hours including a picnic and stops for photographs. 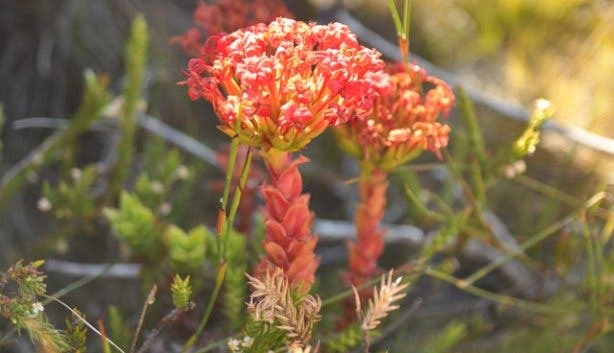 If the fantastic, mind-blowing views are not enough, have a look at the thick and bushyfynbos all around you. Ericas, proteas and indigenous trees are all over as well asbirdlife. If you’re lucky you might see lizards and black or fish eagles. The Chapman’s Peak Drive was the brainchild of Sir Frederic de Waal, the first administratorof the Cape Province (De Waal Drive in Cape Town was named after him). Work on the routebegan in 1915 and the formal opening took place in 1922. Unfortunately, rock falls caused theclosure of this splendid national treasure in January 2000. Public pressure requested thereopening, with this came a feat of astounding engineering. A consortium ofcompanies were awarded a concession to restore this mountain pass to its former glory and toput in place several safety measures that would limit further fatalities from occurring. Thereopening of Chapman’s Peak Drive is the culmination of one of the most innovative roadengineering projects (upgrading and reconstruction) ever to be undertaken in South Africa.Chapman’s Peak Drive was re-opened as a toll road in December 2003.